friends, “A carpet bag is a traveling bag made of carpet, commonly from an oriental rug, ranging in size from a small purse to a large duffel bag.” These bags were very popular in the latter half of the 19th Century, a period in which the Oriental carpet became a fixture in better homes in Europe and America. 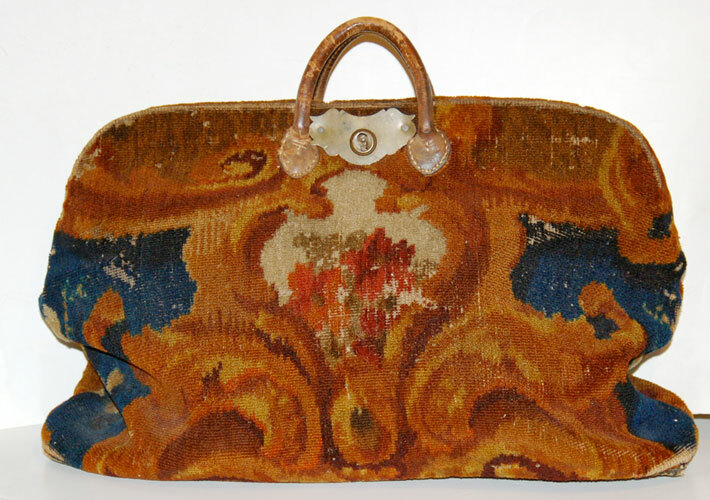 But popular or not, it is hard to imagine that most carpet bags were made out of chopped up Oriental rugs; it is more likely that most of those reprehensible individuals mentioned earlier were lugging bags constructed from the “remainders” of rugs machine-manufactured more locally. The machine carpet industry in the United States began in 1791 when William Sprague started the first woven carpet mill in Philadelphia. No doubt it had an even earlier start in England. 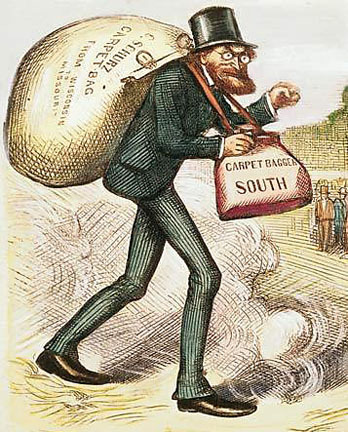 Carpet bags were also called “railway rugs.” For anyone but the wealthy few who could afford their own heated railway cars, travel in the 19th Century was a damn cold business during the winter. Some large carpet bags could be opened as a blanket as mentioned by Robert Lewis Stevenson: “..my railway-rug, which being also in the form of a bag, made me a double castle for cold nights.” I haven’t been able to find an image of a railway rug. Let me know if you find one or have one.